Renowned ophthalmologist Sonny Goel offers PRK surgery at his Baltimore, MD-area practice. While LASIK surgery involves creating a hinged corneal flap that acts as its own bandage following refinement of the inner cornea, PRK involves removing the outer corneal layer entirely. This procedure is often recommended to those who have very thin corneas, or those who have occupations that carry a risk of eye injury. The results of PRK surgery are very similar, helping many patients to achieve 20/20 vision or better. Though PRK is not as common as LASIK, the procedure is still very safe and effective. This is especially true when you receive treatment from Dr. Goel who, with years of experience and a true dedication to his patients’ wellbeing, can achieve dramatic results with minimal discomfort. 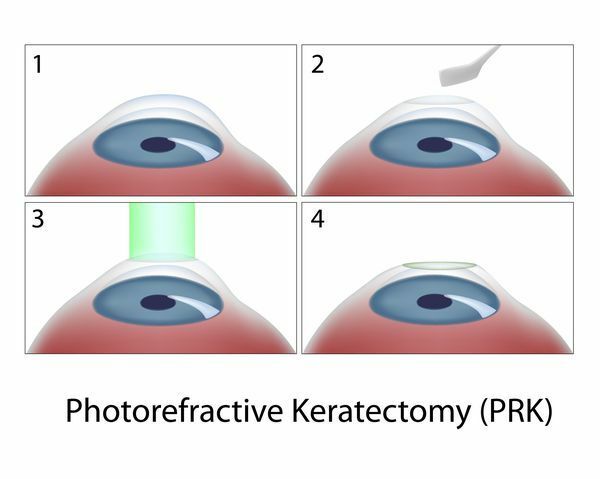 PRK is often recommended to patients who have very thin corneas and cannot safely undergo LASIK. Before your surgery, Dr. Goel will numb your eye with anesthetic eye drops so that you remain comfortable throughout the procedure. Then he will remove the top layer of corneal tissue and employ an excimer laser to reshape the inner layer of your cornea, correcting the way that your eye refracts light. Most procedures take less than 20 minutes. We do ask that patients have someone drive them home afterward, since postoperative vision will be blurry. After he has removed tiny amounts of tissue, Dr. Goel will place a protective shield over the front of your eye. This device, which will feel much like a contact lens, will protect your eye as the corneal tissues regenerate. Most procedures take less than 20 minutes. We do ask that patients have someone drive them home afterward, since postoperative vision will be blurry. After PRK, it is normal to experience some inflammation and blurred vision. These side effects will usually go away in about a week, although it can take up to six months to see the final results of your treatment. Dr. Goel will provide anti-inflammatory eye drops to prevent dryness and help your eyes heal faster. It is important to use the drops and wear your protective eye shields as instructed, even when you are sleeping. In addition, you should get plenty of rest for the first few days and avoid rubbing your eyes. In most cases, you can go back to work and resume your daily routine a few days after PRK. However, it is still vital that you maintain your follow-up appointments so Dr. Goel can monitor your recovery. Patient education is the key to the success of any medical procedure, and he will make certain that you are informed at every stage of planning, surgery, and recovery to ensure that you achieve the best possible results. If you have been told that you do not qualify for LASIK due to thin corneas or other characteristics, PRK surgery may be recommended. To learn more, contact Dr. Goel’s office today.